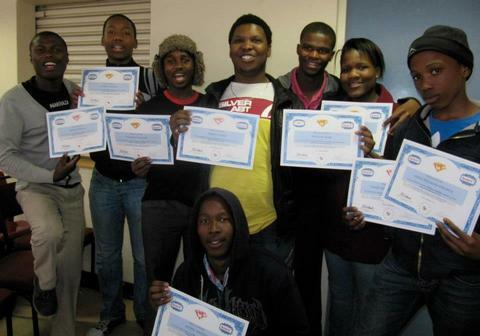 Monday, 10th December 2012: Excited Ikamva Youth learners from Umlazi and Chesterville were treated to a set of presentations by Amalgamated Beverage Industries (ABI) in Phoenix Business Park. ABI is the leading distributor of Coca-Cola products in the southern hemisphere. 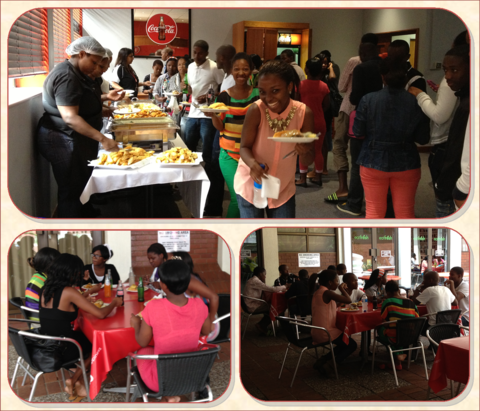 ABI is a firm supporter and sponsor of the Ikamva initiative. Ikamvanites were informed about the working of the company, the respective responsibilities of the various departments, and the career opportunities available at ABI. Staff members of ABI provided important information and advice to students about study trajectories that would afford them a chance to work for a company like ABI. Learners were responsive and posed a number of questions to the speakers and expressed interest in pursuing careers at ABI. A lovely lunch was had, after a tour of ABI’s factory floor. Learners and tutors listening tentatively to the advice offered by the ABI staff. On the 22nd of October 2012; in Grahamstown; we approached our first school in our quest for partners in the fight against the Education crisis facing our country. The name of that school is Nombulelo Senior Secondary School; together with two other schools they have come on board to be part of our first branch in the Eastern Cape. The other two schools are Khutliso Daniels and TEM Mrwetyana Senior Secondary Schools. 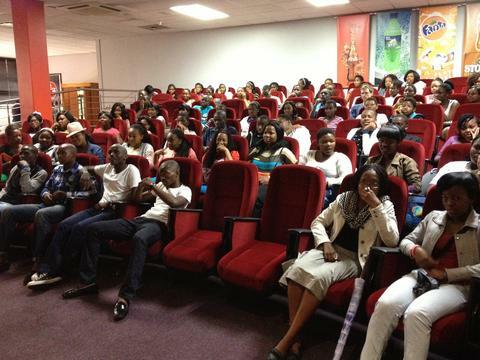 IkamvaYouth is breaking new ground in the Eastern Cape. The strides we have managed to take in this short period are testimony to the level of support we have received from this community. MOU’s with the schools have been signed; the tutoring venue has been secured; office space is available and educators are ready and willing to render the required support. We are humbled by the warmth and cooperation received from the various community based stakeholders. 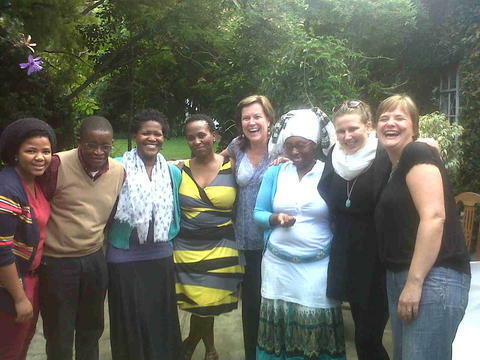 It all began with a visit to the Rhodes University Community Engagement centre. Without their support in helping us navigate our way in a new environment it would have been a steeper climb. 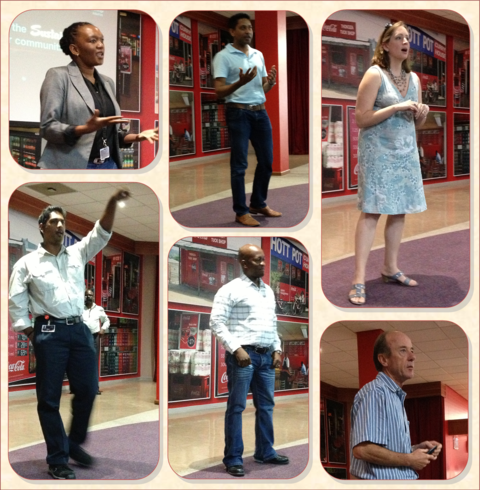 IkamvaYouth owes Di Hornby and her team a bucketful of gratitude. 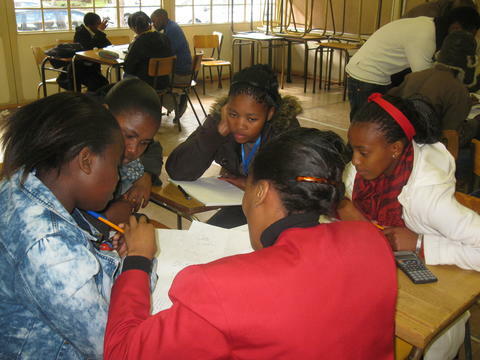 Education Without Borders (EwB), a Canadian based organisation, aims to provide improved educational opportunities and facilities in disadvantaged regions of the world and highlights the simplicity of mathematics and emphasises the critical importance of foundational skills while acknowledging the complicated challenges and circumstances of life, which many of IkamvaYouth learners are coping with. 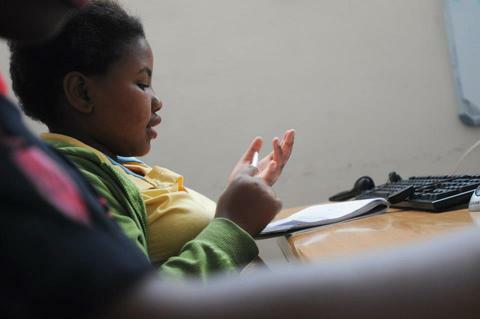 EwB focuses on our Grade 8s as the program helps lower grade learners understand basic maths principles. 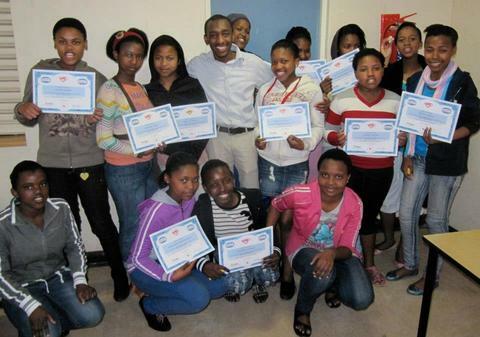 The program was facilitated by Nicolas Mei and he has been with the learners since its inception in 2011. Below we share some of the results we have achieved this year. 20 learners started the EwB program at the beginning of 2012 in total, 2 were excluded because of poor attendance, 2 dropped out and the 16 is still doing well in the program. All the learners come from different schools across Khayelitsha. Figure 1: EWB learner term 1 & 2 math results and school grade aggregate result comparison. Figure 1 shows some great results in learners school reports, gained after they have achieved good results in the internal test for the term after the completion of Book 1&2, which provided training for their June exams. For the majority of the class their tests scores covered by the books were significantly higher than the school results. Figure 2: EWB learner term 3 math result and school grade aggregate result comparison. Figure 2 shows some momentum by the EwB learners in their school results, gained after they achieved good results in the internal test for the term after completing Book 3. By this point the books are catching up with the work they are dealing with in class and the results show a significant increase not only in mathematics but in all other subjects as their confidence grows. The learners who have participated throughout the year and attended regularly showed the greatest improvement and delivered results not only in math, but also in other academic areas. In some cases where we saw huge imprvements in math results or term averages, the learners were visibly more confident and focused on achieving an understanding of the subject. Learners that stood out even more were those that did not only have major leaps in their math results, but who also provided their peers with the necessary help to achieve. These learners are wonderful examples of the excellence of the class and their results for the three terms are highlighted below. Table 2: EWB outstanding learners throughout the year. These learners didn’t only achieve academically, they also received Ikamva Youth Best Attendance, Most Committed and Top Learner for achieving 95%+ attendance, for showing leadership and commitment in class. Looking at the grade 9s of 2012, that took part in the program, most of the learners scored 70% and above and 8 learners scroring a level 80% and above in the final exams. This shows the great impact and the good foundation that the program provides the learners. This is also very good for IkamvaYouth and our mission of getting more black learners into tertiary institutions and with the results that we currently have, we can foresee a bigger group of learners that will become the scientist, engineers and doctors we need in this country. IkamvaYouth is very thankful to Education Without Borders for enabling us to implement the Math Yes We Can books for our Grade 8’s, and also for making a difference in the future of our youth. Special thanks to: Cecil and Ruth Hershler-funding provided through Education Without Borders, ‘Yes We Can’ math books writen by Dr Rahael Jalan and Nicholas Mei – Grade 8 facilitator. Building a solid foundation in mathematics in learners at an early stage of their mathematics schooling careers is one of the major problems facing our education system. The Education Without Borders program (EwB) was piloted in Nyanga this year helps tackle this problem in a well-structured series of basic mathematics books, written by Dr. Rahael Jalan, to a class of 14 learners. The program was implimented during winter school and for the final two terms of the year. In this short time, as per the comparison below, the results in March (indicated in blue) show a poor level of understanding, the majority of learners scoring 40% and below for grade level mathematics. June results after tutoring three days a week shows a slight increase, but after implimenting the program in the final two terms the results have increased dramatically. Whie the increase in results is a significant improvement and achievement, it is evident from the results at Makhaza that for the program to have results above 50-60% the program needs to run for the full duration of the year. The most notable achivement was an increase in results by 43% from term 2 to term 4. *Note – these results were from independant tests administed at the branch, the schools we work with had administative difficulties in releasing quartely reports and as such the results are independant tests. It has been a wonderful experience of teaching and learning. Some of our learners have shown great interest and a major boost in confidence after they had easily grasped the topics with proper guidance from a tutor. I have had a few minor problems with some of the leaners, which we managed to resolve and carry on with the program. 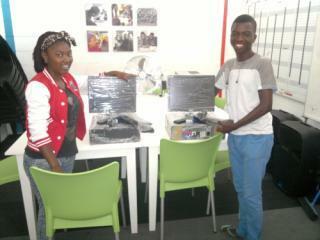 Overall I have enjoyed working with the learners and seeing them develop in their learning abilities. IkamvaYouth is very thankful to Education Without Borders for enabling us to implement the Math Yes We Can books for our Grade 8’s. Special thanks to: Cecil and Ruth Hershler-funding provided through Education Without Borders, ‘Yes We Can’ mathematics books writen by Dr Rahael Jalan. The 1st of December marked world AIDS day, but it was also a day where we honoured our achievers for the hard work they have done during the year. The prize giving was well attended by learners, their families, partners and supporters and IY staff and they bore witness to the great work and sacrifice the learners made and how these sacrifices were converted into achievement. Most of the prizes that were given out were for academic achievement, but we also had prizes for attendance, learners need to be present 75% of the year, and in Makhaza more than 50% of our Ikamvanites had an average attendance of over 90%. This is a great feat as we have tutoring 5 days a week and this dedication just shows how special this programme is to the learners. Other certificates included the most improved learner per grade, outstanding leadership, learner of the year voted by learners as well as tutors and the most committed learner per grade. 11 learners walked away with computers donated by Capitec, 18 learners received a prize of a day trip with Carl Palmer and others received stationary packs. Our tutors also received certificates and were thanked for their efforts and the time they spent tutoring. The Khan Academy and Marion Walton from UCT also handed out certificates and prizes for the projects they ran during the year. We would like to thank all our partners and supporters, especially Capitec, Numeric, The University of Cape Town, Sinakho high school, Education Without Borders, Carl Palmer, Marion Walton, Andrew Einhorn, Ikapadata , Reel Lives, the Nazeema Isaacs library and staff.